Two leading figures of China's young generation of directors will compete in the 63rd Cannes Film Festival, which opened on Wednesday. 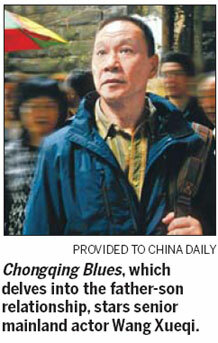 Wang Xiaoshuai, a frequent presence at European film festivals, brings Chongqing Blues, a film about a father's search in the southwestern city for his missing son. Senior mainland actor Wang Xueqi plays the father. The film was previously in the Un Certain Regard lineup, but on April 23 was suddenly made a contender for the Palme d'Or, together with 17 other films. Wang is no stranger to Cannes. Two of his works were selected for the Un Certain Regard section in 1999 and 2004. In 2005, his Shanghai Dreams won the Jury Prize, the top award after the Palme d'Or. But he told a press conference in Beijing before leaving for France that, "To win at Cannes is much more difficult than at the box office". Also representing China is veteran filmmaker Jia Zhangke with his latest film I Wish I Knew, which will screen in Un Certain Regard segment. The film is a documentary feature. Eighty Shanghai people, including painter Chen Danqing and writer Han Han, tell their life stories, which are intertwined with the history of the city. Jia, a Golden Lion winner of the Venice Film Festival, is a much-loved director in Cannes. His Unknown Pleasures was in the competition line-up in 2002. He led the jury of the Cinefoundation and Short Films Session in 2007 and in 2008, his 24 City competed for the top award. This time he will compete with Jean-Luc Godard's Film Socialisme and Hong Sangsoo's HA HA HA, among others. Meanwhile, mainland actor Cheng Taishen plays alongside Javier Bardem in Mexican director Alejandro Gonzlez Inrritu's Biutiful, a competitor for the Palme d'Or, but Cheng could not make the France trip as he's starring in Zhang Yimou's new film. Qin Hao, the star of Spring Fever, winner of the best script at last year's Cannes festival, will walk on the red carpet again, thanks to playing in Chongqing Blues. Some Chinese filmmakers, such as Jiang Wen and Hark Tsui, will present their works at Cannes' film fair. Jiang's work Let the Bullets Fly has a huge cast including Chow Yun-fat, Ge You and Jiang himself. It tells a story of gangsters, bandits and officials in the early 20th century. Tsui's Detective Dee and the Mystery of the Phantom Flame is based on the stories of a legendary ancient detective. Hong Kong star Andy Lau spearheads the cast, that includes Carina Lau, Tony Leung Ka Fai and Li Bingbing. The festival ends on May 23.